Congratulations to Kiara Maendel and Kenneth Davidson!! 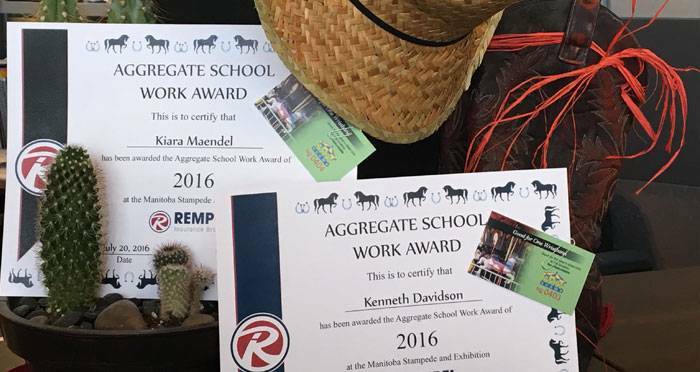 Both received a 4 day midway ride bracelet, for girl and boy aggregate winners of the schoolwork competition sponsored by Rempel Insurance at the Manitoba Stampede & Exhibition. Each year, the girl and boy who accumulate the most prize money in the school work competition receive a one day all you can ride bracelet from Rempel Insurance. These students are proud to show off their work. Stop by and view the exhibition at the orange building during Stampede.